Mii-dera is originally the main inner temple of the Tendai-jimon sect. it became an independent temple on the mount Hiei-zan in 13th century. The front of the temple gate is made of a stone wall, conveys the history of the contention between Mii-dera and Enryaku-ji. The Kon-do is designated as a National Treasure. The Kon-do enshrines an image of Miroku-Bosatsu (a Bodhisattva who is supposed to appear in the future world as the successor of the Buddha). Other structures here have been designated as Important Cultural Properties, including the Nio-mon (a gate with images of Deva kings on either side), on both sides of the entrance to which stand Buddhist images, and the three-storied pagoda. The sound of the bell at this temple has been admired for its beauty in literature since ancient times. 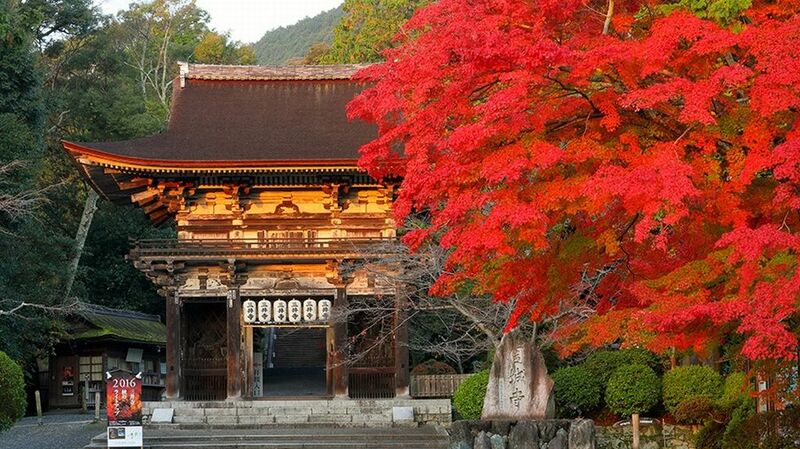 This temple is also famous for its cherry blossoms (1,500 cherry trees on the grounds) and Autumn colors. Mii-dera Temple is one of the four largest temples in Japan, there are 40 named buildings in the Mii-dera temple complex. The area is lit up, creating a magical atmosphere with the bright colors of autumn leaves.